It’s the moment you’ve been waiting a whole year for, the Battle Royale-slash-Hunger Games of red carpets: the 89th Academy Awards. Who will live? Who will die? Who will revolt against the whole system in an attempt to save humanity from a genocidal caste system? Who will be this girl? Everyone and no one! Let the games begin! I’ll be constantly updating this as these gladiators arrive. Best Actress nominee Ruth Negga is an early favorite in a crimson lace Valentino (with ACLU ribbon accessory) that I can’t get enough of. Moana’s Auli’i Cravalho has a pegasus thing going on; Cynthia Erivo is shining bright like a diamond in that gorgeous embellished ball gown; Olivia Culpo’s tiered and beaded joint is quite pretty and wowie Ruth Negga. Her beauty is on point, too—smoky eyes and brick-red lips are perfect for a night like this. Felicity Jones and Isabelle Huppert are forecasting an early trend by wearing delicately icy gowns with ballerina and grande dame vibes, respectively. Mica Levi, aka Micachu, who has a nomination for her Jackie score, kept it simple and comfortable in boots and an oversized rust-colored suit. Raphaela Neihausen is up for Best Documentary Short (for Joe’s Violin), and her dress is not too self-serious, the joy of Spring in embellishments. More white! Brianna Perez is the teen violinist from the Bronx who is featured in Joe’s Violin, and she looks like a princess in that simple gown and pixie cut! Hailee Steinfeld’s elaborately floral number is also a dream, but I’m really feeling the bold impact of Michael Strahan’s navy velvet tux and especially Robin Roberts’s gold sequins—because it’s beautiful and I’m really into it when people attending the Oscars also cosplay as an Oscar. Jackie Chan brought the stuffed representations of the pandas he adopted after the earthquake in China, according to what he’s telling Seacrest on E! right now. Definitely some of the least dubious dates here tonight. Why are so many people wearing white tonight so far? A commentary on the nominees? Arctic sea ice awareness? Darby Stanchfield is draped in sheer tulle and, again, looks like a cloud, as does the ostrich feather skirt of Sofia Boutella’s sequined number. Teresa Palmer kept it simple and Grecian, while Shohreh Aghdashloo’s black sequins are regal and stunning. Please take in the genius Barry Jenkins looking extremely sharp in this tuxedo, black glasses and brilliant smile! He should win! Sunny Pawar had the right idea with his sneakers (also he is a child). Sting (with Trudie Styler) smartly accessorized with a scarf while Viggo Mortenson kept it real in a three piece. Hmm... My friend Haley suggested to me that everyone is wearing white because of the Suffragettes. Surely an extravagant evening of celebrating rich people is what they envisioned! Emma Roberts is wearing vintage Armani Privé because of sustainable red carpet fashion, and it looks fine. Karlie Kloss is a supermodel who dressed like a superhero and also is flossing an ACLU ribbon as an accessory. 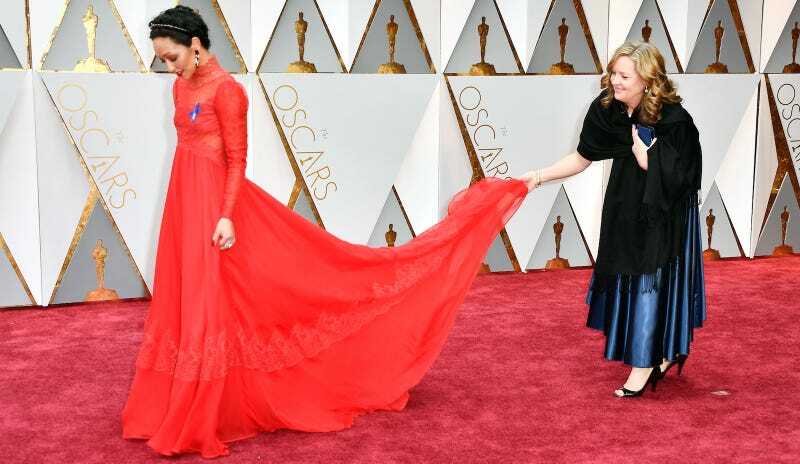 Hey, I really love Leslie Mann’s organza thing; the construction is voluminous and feminine and yeah, so what if she looks like Beauty and the Beast. Riz Ahmed is a guy who I first knew about because he rapped, so it continues to be wild seeing him at these jams. Nice blue tux, Riz! Cleans up nice. Trevante Rhodes, Alex R. Hibbert, Ashton Sanders. Enjoy, and see Moonlight (again). Chrissy Teigen’s been doing this leg-reveal and I’m totally here for it. Ginnifer Goodwin’s red lace jawn pops but there’s something a little Amish to it? Taraji P. Henson is wearing navy velvet Alberta Ferretti and every aspect about her look is just freaking breathtaking. I’m in the cult! Ava DuVernay looks gorgeous as usual, and the slate grey is such an interesting, unorthodox and lovely choice for the carpet. Kirsten Dunst kept it simple in taffeta with pockets, while Pharrell and Mimi Valdes both look somewhat baroque and regal—his cluster of Chanel accessories, her delicate embroidery and braid-crown. David Oyelowo and Moonlight’s Jharrel Jerome both look sharp in white tux jackets, and Octavia Spencer’s Marchesa is a feathery dream. Terrence Howard (with Mira Pak) is wearing exactly what you imagine Terrence Howard would be wearing, which is to say a belted smoking jacket. Moonlight is the gift that keeps on giving: Andre Holland is ca-leeean, while Tarell Alvin McCraney brought a really hefty dose of style to the carpet that I’m appreciating—allwhite, no socks, sharp fit. Just great. Jessica Biel’s golden gown is doing her all the favors, particularly the stabby neckline. Dev Patel arrived with his lovely mother Anita Patel in a velvet sari and I am dead. I just want to point out Saniyya Sidney, with her Fences castmates, looking like the most graceful ballerina. Luciana Barroso, with husband Matt Damon, chose a quicksilver satin and it’s good. Dakota Johnson is wearing butter-yellow Gucci, because of course she is! John Cho and Kerri Higuchi look great, and I don’t even need to say anything about Mahershala Ali. He is the handsomest man in Hollywood. Look at this princess! Janelle Monáe’s wearing Elie Saab, and while I do not have much use for Hollywood stylists in general I feel we should give all credit to Janelle’s, Maeve Reilly, who’s been truly collaborating with her and ramping up her creativity to make her already on-point style just so elevated and elegant. I love this look so much. Alicia Vikander’s black lace gown seems a little off—is it the hair?—but she’s so stunning that I can’t deal. Michelle Williams (in Vuitton) and BFF Busy Phillips are maybe the best date situation at these Oscars, but mostly because they have the best bromance. Scarlett Johansson’s mermaid-scale gown is very pretty and light, about what you’d expect a presenter to wear. Emma Stone went old-school Hollywood with beaded fringe; Halle Berry looks just absolutely knockout as ever, though I am not sure about the criss-cross effect on the gown; Laura Dern looks like a starry night, and Nicole Kidman’s racer-back is cute but nearly erases her. Charlize Theron’s green-gold is no doubt Dior, and traditionally pretty, though I prefer Priyanka Chopra’s geometrical look, particularly with the interesting cut of the neckline. Is that a triangle? Salma Hayek’s lace is gorgeous but embodies the problem I have with so much red carpet fashion. What is the goal? Viola Davis’s goal, though, is always clear: primary colors, classic cuts, and subtle slaying, all day. The cut of this gown fits Brie Larson great, and Amelia Warner (with Jamie Dornan, who always looks scared) did something fun with her pale pink dotty cape-gown. Naomie Harris is pure art in that sculptural white sequin jawn by RAF SIMONS for CALVIN KLEIN, and I appreciate the modernism the most. Meryl Streep looks absolutely lovely and extremely expensive in this Elie Saab gown! Aldis Hodge is one of the best dressed men tonight, not just because of the fit but because he is simply killing me with that lapel pin/timepiece? Perfection. Pauletta Washington, with Denzel, chose a perfect shade of beaded gown, and the off-the shoulder situation works. Unfortunately, I cannot say the same for Ryan Gosling, who is wearing the tuxedo of a third-rate wedding singer from Dubuque. Does he hate himself? Is he trying to be in the next season of Fargo? What’s up with this.